This is part two (past due...see part one) of a series of posts about the Popol Vuh, which is an oral transmittal of an ancient Mayan codex given by Quiché noblemen in the 16th century. In this post, I am using a readily available translation online for copying and pasting, and to which I will add my own notes. It is similar enough to the translation I was making from the summarized version I obtained in Guatemala and saves me from having to translate from Spanish to English. 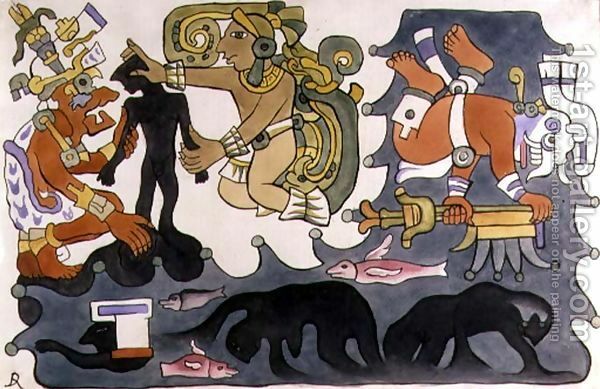 I will still use the topical dividers (via the blog post title) of my Guatemalan version as a convenience in pointing out similarities between Biblical Old World and Indigenous New World accounts of creation. For this reason another attempt had to be made to create and make men by the Creator, the Maker, and the Forefathers. "Let us try again! Already dawn draws near:3 Let us make him who shall nourish and sustain us! What shall we do to be invoked, in order to be remembered on earth? We have already tried with our first creations, our first creatures; but we could not make them praise and venerate us. 4 So, then, let us try to make obedient, respectful beings who will nourish and sustain us." Thus they spoke. This "starting over" can be paralleled with dispensations of the Gospel. When men were wicked, they were destroyed and God started over. It is interesting that this concept is found in the Bible, the Book of Mormon, and the Popol Vuh, along with other pre-Columbian American texts. Then was the creation and the formation. Of earth, of mud, they made [man's] flesh. But they saw that it was not good. It melted away, it was soft, did not move, had no strength, it fell down, it was limp, it could not move its head, its face fell to one side, its sight was blurred, 5 it could not look behind. At first it spoke, but had no mind. Quickly it soaked in the water and could not stand. And the Creator and the Maker said: 6 "Let us try again because our creatures will not be able to walk nor multiply. Let us consider this," they said. Then they broke up and destroyed their work and their creation. And they said: "What shall we do to perfect it, in order that our worshipers, our invokers, will be successful?" Jacob 5 in the Book of Mormon is reminiscent of the maker noted above in that the Lord of the vineyard makes several trials at having a successful crop and harvest. The allegorical devices are very similar to each other. Thus they spoke when they conferred again: "Let us say again to Xpiyacoc, Xmucané, Hunahpú-Vuch, Hunahpú-Utiú: 'Cast your lot again. Try to create again.'" In this manner the Creator and the Maker spoke to Xpiyacoc and Xmucané. Then they spoke to those soothsayers, the Grandmother of the day, the Grandmother of the Dawn, 7 as they were called by the Creator and the Maker, and whose names were Xpiyacoc and Xmucané. And said Huracán, Tepeu, and Gucumatz when they spoke to the soothsayer, to the Maker, who are the diviners: "You must work together and find the means so that man, whom we shall make, man, whom we are going to make, will nourish and sustain us, invoke and remember us. "Enter, then, into council, grandmother, grandfather, our grandmother, our grandfather, Xpiyacoc, Xmucané, make light, make dawn. have us invoked, have us adored, have us remembered by created man, by made man, by mortal man. 8 Thus be it done. This mention of a "council" hearkens back to the council in heaven mentioned by Abraham in the Book of Abraham, which Joseph Smith translated from Egyptian papyri. Before you read the next few paragraphs, read Doctrine & Covenants 121:32, Job 38: 7, Alma 13: 3, Abraham 3: 22, Abraham 4: 26, Abraham 5: 2. "Let your nature be known, Hunahpú-Vuch, Hunahpú-Utiú, twice-mother, twice-father, 9 Nim-Ac, 10 Nima-Tziís, 11 the master of emeralds, the worker in jewels, the sculptor, the carver, the maker of beautiful plates, the maker of green gourds, the master of resin, the master Toltecat, 12 grandmother of the sun, grandmother of dawn, as you will be called by our works and our creatures. "Cast the lot with your grains of corn and tzité. 13 Do it thus 14 and we shall know if we are to make, or carve his mouth and eyes out of wood." Thus the diviners were told. Beginning the divination, they said: "Get together, grasp each other! Speak, that we may hear." They said, "Say if it is well that the wood be got together and that it be carved by the Creator and the Maker, and if this [man of wood] is he who must nourish and sustain us when there is light when it is day! "Thou, corn; thou, tzité; thou, fate; thou, creature; get together, take each other," they said to the corn, to the tzité, to fate, to the creature. "Come to sacrifice here, Heart of Heaven; do not punish Tepeu and Gucumatz!" 18 Then they talked and spoke the truth: "Your figures of wood shall come out well; they shall speak and talk on earth." "So may it be," they answered when they spoke. And instantly the figures were made of wood. They looked like men, talked like men, and populated the surface of the earth. Now we read about how the Mayan gods became displeased with the outcome of their work. Compare the passages below with Genesis 6 and Genesis 7, and with Moses 8: 18, 26. They existed and multiplied; they had daughters, they had sons, these wooden figures; but they did not have souls, nor minds, they did not remember their Creator, their Maker; they walked on all fours, aimlessly. They no longer remembered the Heart of Heaven and therefore they fell out of favor. It was merely a trial, an attempt at man. At first they spoke, but their face was without expression; their feet and hands had no strength; they had no blood, nor substance, 19 nor moisture, nor flesh; their cheeks were dry, their feet and hands were dry, and their flesh was yellow. These were the first men who existed in great numbers on the face of the earth. Immediately the wooden figures were annihilated, destroyed, broken up, and killed. A flood was brought about by the Heart of Heaven; a great flood was formed which fell on the heads of the wooden creatures. Of tzité the flesh of man was made, but when woman was fashioned by the Creator and the Maker, her flesh was made of rushes. 1 These were the materials the Creator and the Maker wanted to use in making them. This was to punish them because they had not thought of their mother, nor their father, the Heart of Heaven, called Huracán. And for this reason the face of the earth was darkened and a black rain began to fall, by day and by night. Then came the small animals and the large animals, and sticks and stones struck their faces. And all began to speak: their earthen jars, 4 their griddles, 5 their plates, their pots, their grinding stones, 6 all rose up and struck their faces. And the grinding stones said: "We were tormented by you; every day, every day, at night, at dawn, all the time our faces went holi, holi, huqui, huqui, because of you. 8 This was the tribute we paid you. But now that you are no longer men, you shall feel our strength. We shall grind and tear your flesh to pieces," said their grinding stones. And then their dogs spoke and said: "Why did you give us nothing to eat? You scarcely looked at us, but you chased us and threw us out. You always had a stick 9 ready to strike us while you were eating. So was the ruin of the men who had been created and formed, the men made to be destroyed and annihilated; the mouths and faces of all of them were mangled. And it is said that their descendants are the monkeys which now live in the forests; 14 these are all that remain of them because their flesh was made only of wood by the Creator and the Maker. And therefore the monkey looks like man, and is an example of a generation of men which were created and made but were only wooden figures. Just as in the Genesis chapters of the Bible, we find that the gods mentioned by the Maya were similarly displeased with the disastrous outcome of their creations. The tradition of a great flood is found in nearly every ancient culture. A Babylonian account, that of Gilgamesh, closely resembles the record in the Bible, but the biblical account differs from all others, including the Popol Vuh, in its religious value and the purpose of it. The scriptural account teaches that the flood was sent to cleanse the earth because of the wickedness of the people. Noah and his family were saved because they were righteous. That a great deal of the Popol Vuh parallels quite closely with the scriptural version of the Great Flood is either a bizarre coincidence, or it shows that the people of the Americas who preceded the Spanish Conquest had in their possession, at some point, a knowledge of the Genesis account and made an effort to retell it. In retelling it, and through hundreds, even thousands of years of political and religious upheavals, they likely altered it in certain ways, yet had somehow managed to keep the general theme of that oral tradition intact.